Drawing has been inlaid on another sheet, but the verso is visible. The land to the north-east was a warren of houses, courts and passages. In this era of protests and riots, such a dense cluster of buildings so near to the Bank's walls was a source of anxiety. 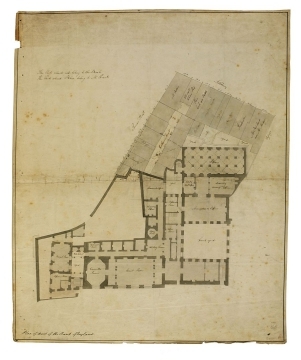 The bill submitted by the Bank to Parliament in 1793 (and approved) referred to the houses' flammability and the "various hazardous trades" that they harboured. Drawings 1 and 2 show the density of the area and its proximity to the Bank. Circulation of traffic was also hampered by the disorderly layout; drawing 1 shows that the north end of Bartholomew Lane was largely obstructed by houses projecting into the street. Once the land was obtained, the streets could be widened and the houses demolished. After Bartholomew Lane was straightened, however, there remained an 'island' of rubble or houses (see drawings 3-5). 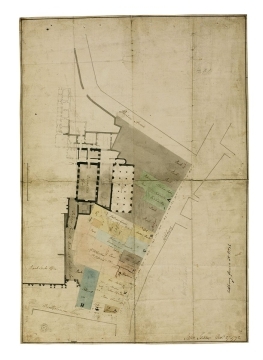 On 12 June 1798 the Building Committee moved to 'pull down the houses on Bartholomew Lane', presumably referring to this last remnant of buildings.